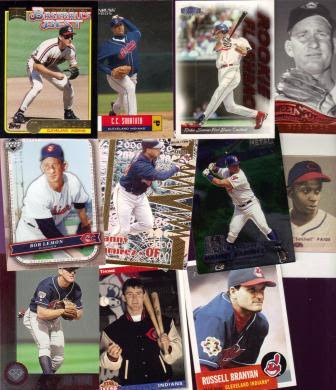 This group features Jim Thome on a Mickey-D's gold card. How does it better than that!? There's also C.C. tossing around a bit. Richie Sexon appears on a Fleer Tradition Rookie Flashback embossed card. That's a new one for me. Bob Lemon makes a couple of appearances here as well! I have never seen the Man-Ram Pacific Revolution 2000 variety of card before either. It's a holographic fit of craziness! 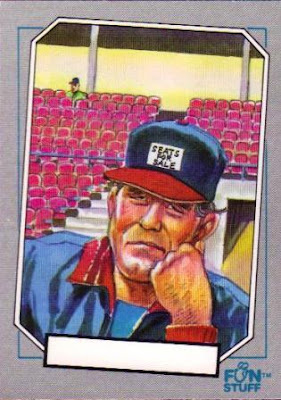 Things wouldn't be complete without Man-Ram on a Metal Universe card, playing ball in the middle of some farm field somewhere in Ohio... Really, what are card designers smoking? Satchell comes in on of those Bowman send-in cards. Unfortunately, the cutoff date was March 10, 1990. Yeah, that's right, nearly 20 years ago. Man, a 1990 card is now 20 years old? How did that happen? Of course, I gotta throw in another Thome (there were a LOT in the box!) or two. Russell Branyan's Heritage card finishes out this group. 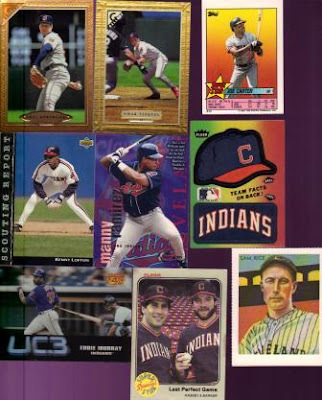 Of course, you can't expect to get cards from Ed and not get some vintage Indians in there! 1967 Topps and 1961 Topps! The '61 is in perfect Tipton shape! Creases (more like folds), busted corners, layer separation, and more. Great card!! I'll have to check, but if I already have these and if ToppsTribe needs them, they will be finding a new home shortly. I threw in the Baerga Stadium Club Statistical Extreme to show how different cards had become over the years. I threw in Cliff Lee because, well, he *IS* Cliff Lee after all. The Gerut Fleer Genuine Insider is a cool mix of reds and 'golds.' I don't think I've heard of Charles Lafgren, but here is his 2006 TriStar Prospects Plus card - shiny! 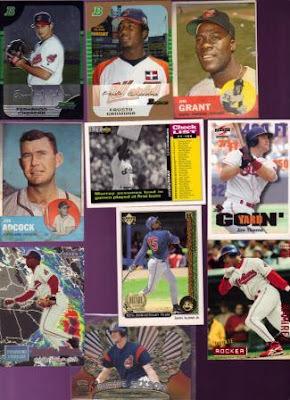 The Lofton is a Sports Cards Magazine insert. Nice throwback work. The Alomar is from the All-Star fest in San Diego. Tadano comes to us on a 2005 Diamond Kings card. The card is nice, but man the player photo gets swallowed up by all the pomp and circumstance of the card itself. V-Mart is handing out high-fives all-around! And, Thome makes another showing on a Pinnacle SHINY card. Cabrera (Fernando) is followed by Carmona, both on Bowman. Carmona, of course, if the Tribe's 2nd leadoff pitcher this year, so we expect great things from him. Mudcat and Adcock Tip(ton) their way into the scene on a couple 1963 Topps. Adcock's got water stains, Mudcat's scratched and faded. These cards have been not-so-gently loved over the past 46+ years! I included the Murray card because in it, he is holding up first base. Now, in most cases, bases are given (or the player steals them literally) to players who have, er, uh, stolen, the most bases. In Murray's case, he was allowed to take home a base for being the player who (at the time) had played the most games at first base. Who holds the record for the most games played at first base these days? Yeah, I have no idea. Be the first one to reply with the correct answer (and where you found it) and I'll drop a special somethin' somethin' in the mail to ya. 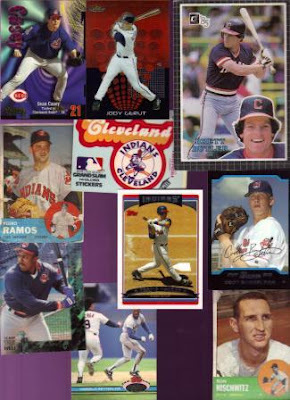 I also threw in Thome's "Goin' Yard" card and Man-Ram's "Rookie Rocker" Stadium Club. Yes, there's another Alomar card, but this one is the 10th Anniversary Team from UD - Decade Dominators. Hard to believe it is about time for them to another one of those again... Are you seeing the Wilson "Promising Forecast" card? I have to say, there is nothing quite like seeing the satellite cloud cover serving as the background image of a baseball card. At least the designer was smart enough to include OHIO on the thing. And then we have one of my favorite sets ever - Pacific Crown Royale 2000. It's a die cut. Of a crown. You see? That is oddball heaven right there, folks. This is the very reason I wrote my blog bat-around #4 on oddball cards. One day, this card will be worth... well, it will be worth a lot, I can tell you that much. I love 3D cards. In fact, I considered trying to make the 'DoubleVisionary' cards 3D. Yeah, I don't have the money or the know-how. So, we get to enjoy things like the Eddie Murray UC3 instead! Ron Hassey and Len Barker pose for a "Perfect" picture (sorry, couldn't resist). Unfortunately, so far the caption on the card has held true for the Tribe: it was, in fact, the last perfect game thrown/caught. Wonder if Lee or Carmona can change that? Lastly in this scan, we have Sam Rice on a 1935 National Chicle card! Okay, yeah, I know, you can see the perforations around the edges. Yes, those in the know have already recognized the Dover Reprint that is this card. At least Dover listed the actual card info on it AND they included the 'Dover Reprint' branding. I have seen several reprints that have no bearing on who did the reprints or when. Makes researching these guys tough. And, finally, we come to the last scan of the box. If you've managed to read along this far, I appreciate it! Here we have a Skybox Thunder Sean Casey in a Tribe uni after being traded to the Reds. Jody Gerut is featured on a high-tech Topps Finest. I also threw in the Indians logo sticker from the Grand Slam hi-gloss series. The Fleer Sticker Project did a series on these puppies. It is very tempting to want to peel this and stick it to something. I'll have to check my stickers and see if I already have this. I think I do, and in fact believe it came from The Fleer Sticker folks! I got several Pronk cards and had to post at least one. Cody Bunkelman is someone I have never heard of, but his name struck me such that I just had to post his card. Ah, and Pedro Ramos. Look at that, would you? Creased, torn, and worn toilet-paper thin! A fine Tipton specimen. 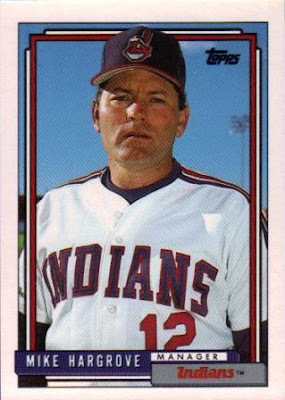 Sam Horn, like Sean Casey, is wearing a Tribe uniform but the card reads "Yankees." I also had several cards that showed a player on another team as the featured player, but had a Triber on the card with that player. I should have scanned one of those. But, I didn't, so we'll continue... Wait, yes I did! Here is Harold Reynolds being run-down by Carlos Baerga! I forgot I had scanned that! Ron Nischwitz should have a phrased coined after him based on his name alone. According to the back, 'he's a crafty hurler with good stuff.' Honestly, that sounds like something you'd see on the back of Garth Algar's card. And, last but not least, we have a super-sized '85 Donruss Brett Butler card! Excellent! 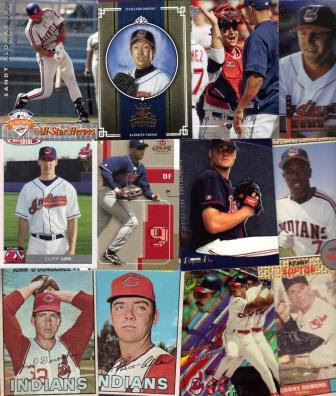 Thanks a TON to Ed for a box full of great Indians cards! I don't know if it is official but looks accurate to me. Thanks, Duane! I'll drop your prize in the mail soon! Glad you liked your box of goodies! Holy Crap !! As Frank used to say , God rest his soul. What a nice assortment of cards.There ARE some there that don't look familiar.Have FUN with that box ! !